Begin your day with a simple chakra meditation to alleviate stress and anxiety, improve self-esteem and boost your overall health. Although it takes less than five minutes, this meditation goes deep, re-balancing your body, energy, emotions, intellect, and spirit. So what is a chakra anyhow? 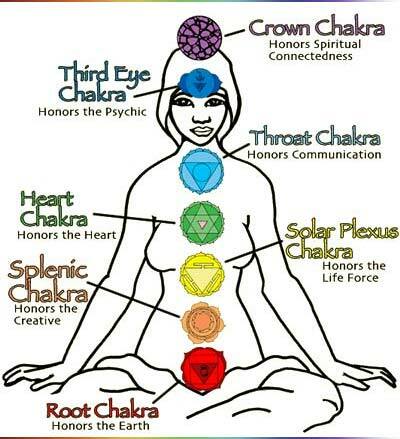 Chakras are “wheels” or “disks” of energy concentrated in different locations throughout the body. There are seven main chakras that coincide with major organs and nerve centers located along the spine. Alongside a strong connection to the physical and energetic bodies, the chakras have psychological and spiritual significance. Each chakra is associated with a color, a location in the physical body and a deeper meaning. This uplifting chakra meditation comes from the Nosara Yoga Institute. It’s simple. Sense each chakra and picture the coinciding light rippling outward from the energetic center in your body as you repeat the following affirmations. Begin by sensing one chakra at a time, starting at the root and working your way to the crown. At the end of the meditation, you can imagine all of the chakras lit up at once. Root Chakra: I have the right to be here now. Splenic Chakra: I have the right to feel all of my sensations, feelings and emotions. Solar Plexus Chakra: I have the right to be myself. Heart Chakra: I have the right to love and be loved. Throat Chakra: I have the right to speak my truth. I have a voice! Third Eye Chakra: I am guided by my own internal wisdom. Crown Chakra: I surrender to the divine flow of the universe. Samsara is a wheel. It’s the cycle of reincarnation, a continuous spin of birth and death as the soul completes its time in one form (human, animal, or divine) before landing in another. Whether or not you believe in actual reincarnation, there is a profound lesson to be had from the concept of samsara itself: Everything changes, continually. In the course of our lives we will birth and let go of many identities, beliefs, goals, relationships and epiphanies. In this way we are coming into new forms again and again. An appreciation and understanding of samsara as a natural and necessary process may make it easier to work through those moments of transition: They are periods of illumination that urge us to grow. The more we come to expect and anticipate these moments, the more comfortable we can become in the big-shift feelings that accompany them—the euphoria and anxiety of creating something; the sadness and tenderness of letting something go. These are as natural and necessary as the events the spark them. On the mat, on a micro level, we move through this cycle of continuous flow over the course of a yoga class. We start the class feeling one way and emerge at the end changed, however subtly. Each pose, held for a series of breaths, has a life cycle: the satisfaction of finding it; the deepening of sensation the longer we stay in it; the frustration of holding it for too long; the decision to stay with it; and then the relief or sadness at leaving it. Play with samsara in your on and off-the-mat practices. Notice your cycles. See what shifts. Images: Om symbol by Geoff Kim; teacher and students; serpent wheel. Today the moon starts its cycle anew. It will be absent from tonight’s sky, but in a few days a skinny crescent will appear as the moon waxes into fullness on the 18th. As a harbinger of a fresh lunar cycle, the new moon is a potent time to start something new here on earth; from our perspective down below it appears empty, a vessel waiting to be filled. Dark and unilluminated, a new moon also marks an opportunity to turn inward and reflect on those aspects of ourselves that often remain unseen. By the midpoint of its cycle, the full moon, with its bright light and pulsing energy, is a time to celebrate and transform. The new moon is a time to plant seeds for that future growth. Journaling, meditating and carving out time for quiet introspection and self care are all practices supported by the new moon’s tranquil energy. To acknowledge this new phase, consider planting something you’d like to grow. A simple intention setting practice can ground you into the larger rhythms at play while revealing the beginning of a new path. First, make space. Dedicate time — from as little as five minutes to as long as an hour — to sit with yourself. First thing in the morning, before you’ve reached for your phone or had too much coffee, or in the final moments before bed in the evening are both nice times for self practice. Create a sense of ritual. Light a candle, dim the lights, put fresh flowers on your altar. Gather any supplies you might need, like a journal, some incense to set the mood, or a timer to take the stress out of meditating. Practice pranayama. A balancing breath like Anulom Vilom will bring you into the present moment; or, simply breathe in out from the diaphragm, with one hand on your heart and one hand on your belly. With the air newly cleared, ask yourself what you’d like to call in. To make space for the new, you may first need to identify what you no longer need — a way of treating yourself or others, a destructive pattern or a limiting behavior or belief. Make a list. You can write this down or keep it internal. It can be short or long, specific or general. My intention for this new moon is to slow down and listen to my body. My intention this month is to take five minutes every day to practice meditation. If you’ve made a physical list, fold it up and stash it somewhere safe. In a few weeks time when the moon is full, you can take it out to burn, bury or otherwise release what you put down. Non-attachment is key. Be kind to yourself as you identify ways in which you’d like to grow or patterns you’d like to shift without fixating on progress. Taking the time to see yourself as you are and being unafraid of the darker parts is the practice. Setting intentions is a way to articulate your innate and powerful potential. Photos: Moon rising by Liza Lubell; “All The Moons of Our Solar System” by Stella Marie Baer. Over the next few months we’ll #GoDeep into Patanjali’s Eight Limb Path. If you’re just checking in, be sure to read our intro post on the path itself and its first limb, the yamas. So far we’ve also covered the niyamas, asana, pranayama, pratyahara, and dharana. Dhyana, in Sanskrit, means contemplation, reflection and profound, abstract meditation; the seventh of Patanjali’s Eight Limbs, it’s virtually impossible to talk about without mentioning dharana, the limb we covered last week. While dhyana, meditation, and dharana, concentration, may appear to be the same, there are key differences. Dharana is the practice of single-pointed concentration and the tool most at work in the observation of mindfulness; it has natural, off-the-mat applications that dhayana does not, like helping us listen to a conversation more deeply or enjoy an experience more fully. As a tool for meditation, the cultivation of dharana allows us to focus our thoughts on one point — the breath, a mantra, an object, or a sound. Unlike dharana, dhyana is an absolute practice; while you can practice meditation anywhere — on a plane, at your desk, lying in bed — you can not meditate while having a conversation or engaging fully in an experience. It is an experience complete in and of itself. Here’s another way to look at it: Dharana, according to the Indian philosopher and theologist Adi Shankara, is the state of being focused on one object while remaining aware of its many aspects and holding many ideas about that object. Dhyana is the yoga state in which there is only a uniform stream of continuous thought about the object, uninterrupted by different thoughts about the object. Absolutely, but we’re ready for this. The more concrete limbs of Patanjali’s path have been leading up to this abstract, esoteric point. By opening the body, purifying the breath, and practicing concentration in our day to day lives, the state of complete absorption that dhyana requires is not so far off. Create space at the end of your next yoga practice to sit in quiet contemplation, free of agenda or nagging concerns about what needs to happen next. Make room for the mind to still. Watch. Over the next few months we’ll #GoDeep into Patanjali’s Eight Limb Path. If you’re just checking in, be sure to read our intro post on the path itself and its first limb, the yamas, and our second post on the niyamas. Now we arrive at limb #3, asana, the practice of the poses themselves. This limb of the path has gone undeniably main stream, resulting in more leggings and hashtags than Patanjali could have ever dreamed of, as well as increased awareness around the concept of awareness itself and practices like mindfulness, meditation and self-care. Long before Christy Turlington graced the cover of Vogue in Calvin Klein and Upward Facing Bow, the postures associated with modern yoga arose as a way to prepare the body for long spells of seated meditation: Open hips to accommodate a cross-legged seat; a strong back to hold a straight spine; equanimity between the left and right hemispheres of the brain for clear focus. By stretching their limbs and working out their physical kinks, yogis had one less thing to worry about when they sat down to meditate, no nagging aches or distracting bodily tension. In the Yoga Sutras, Patanjali has this to say about the practice of asana: Sthira-sukham asanam. Sthira comes from the root stha, which means to stand firm and sukha translates to joy, happiness, and ease; its component parts are good (su) and space (kha). How to apply this to our practice on the mat? Find strength and ease in your asana — cultivate a good and comfortable seat from which to move. A regular asana practice builds strength, flexibility, balance and discipline on all dimensions — physical, emotional, mental, spiritual. We are asked to sink deeper into challenging positions, observe thoughts and reactions that arise, connect to our life-giving breath, and stay calm. Powerful on its own, asana as part of the Eight Limb Path has potential for serious transformation. “How we spend our days is, of course, how we spend our lives.” This quote by Annie Dillard from her book The Writing Life functions like a great big exhale. It’s a reminder to step back, see our priorities, and reflect on where we expend energy. Dillard’s insight about time is also true of space: How we treat our spaces is how we treat ourselves. By watching how we spend our time and how we use our space we can begin to see how we value ourselves. A simple way to carve out meaningful and profound time and space is to create an area in your home dedicated to meditation or quiet reflection. Most yoga studios have an altar as a way to anchor the room and honor the intentions of the space and the teachers. If it appeals to you, creating an altar in your own home is as important as unrolling your yoga mat when it comes to cultivating a home practice, either of asana or simple mindfulness. First, there are no rules around creating your altar: It is a reflection of you. If you’re looking for direction, think about incorporating the elements into your space and bringing them into balance. Water: A simple glass or a vase with fresh flowers is a wonderful way to call in the water element. Make a ritual of picking or buying flowers for your altar every week — consider it a gift to your spiritual practice. Earth: Flowers, again, ground back into the earth. For something evergreen, consider using dried stems or petals or another gift from the outside world: a beautiful stone, shell, a crystal or piece of wood. Fire: A candle, incense, a smudge stick — like sage, palo santo, or sweet grass — immediately adds a sense of ritual and heightens the senses. Air: The air element is about mutability, flexibility and change. Allow your altar to be dynamic by adding and subtracting elements that newly inspire you or no longer serve you. Photographs, gifts and meaningful mementos are perfectly at home in sacred space. Who are your guides or role models? It might be someone universal, like the Hindu goddess Durga or the Buddha, or it could be someone from your daily life — your parents, child or someone you want to honor. You don’t need to have a dedicated yoga or meditation room in your home for your altar, but if you do, start decorating! For the rest of us, work with what you have. Clear off a shelf, a side table, a corner of your dresser, or even an empty corner. Being able to sit in front of your altar is great, but just having a spot that you’ve steeped with meaning to pause by or look at will remind you to stop and center. Once you’ve chosen your elements and a serene space to put them in, spend some time arranging and organizing. Harmony and balance in your physical space can promote the same internally. Finally, once your space is created, use it. The more regularly you come into your sacred space the more sacred it will become. In Yoga, a minimum of 200 hours of training is required before one teaches. Is there a required minimum number of hours of meditation before one can reach Enlightenment? Can one person meditating for inner peace and positive change contribute to healing the world’s problems? I have heard suggestions of how many minutes per day one should meditate (12, 30, 60) and how many days of silent retreat one must partake in to come to Enlightenment. I have heard many people express an “aha moment” when they found their Enlightenment and other people say it evolves over time with the deepening of their practice. I do believe meditation is the path one takes to reach the summit of Enlightenment. And, I am only at the trailhead of my ascent. I’ve not considered myself Buddhist. Even though I often said when my children were toddling, if there was a Buddhist school, that’s where I’d send them. Now my daughter is studying the psychology of Buddhist meditation at Naropa University and my son is doing a thesis on the influx of Yoga in Western cultures. I questioned what influence monks spending their life in isolation — living out of touch with the happenings in the “real” world — could make towards our world’s problems? I chided tenderly and respectfully, calling the enlightened souls living in caves or up on the mountaintop ‘Fools on the Hill.’ I thought that if I were to live constantly in retreat from the endless list of everyday tribulations existing in our world — well, I’d be sitting in meditative bliss. But how would I then be of service to anybody other than myself? How would this contribute to making the world a better place? A few years ago, I likened myself to the protagonist in Kissing Jessica Stein, looking at my watch every twenty seconds to get through three minutes of meditation. I sought a Buddhist therapist to find my inner peace. One day my Buddhist therapist gifted me with a little box holding a mala blessed by the late yogi Chatral Sangye Dorje Rinpoche. I had no idea what to do with mala beads, or who HH Chatral Rinpoche was. I learned the beads were to hold while I meditated and with each bead focus on thoughts of compassion and loving-kindness for all beings. I like to believe I was bestowed this treasure box and these magical beads because of the values I hold near and dear, those the same as HH Chatral Rinpoche’s. He was a strict vegetarian and a determined advocate for animal welfare. I like to believe my therapist thought the transfer of Rinpoche’s energy into my hands would provide a continuation of intention because he knew I would hold the mala and feel the blessings from Rinpoche’s spirit and continue his wishes for all living beings. While encouraging others to do the same. At the closure of 2015, HH Chartral Rinpoche passed on to parinirvana. I never met the esteemed man; I never traveled to India or Tibet. But, I understand how one enlightened person, living in retreat, practicing meditation — in isolation, in a cave, on a mountaintop — can impact somebody thousands of miles away and his wishes can be carried on. Today, when I sit… in my isolated world, holding my blessed mala… I think of our beautiful world, tribulations and all. I hold the energy from HH Chatral Rinpoche to take care for all animals and our planet. In part, I jest when I ask how many hours of meditation and retreat are required to reach Enlightenment and to attain Buddhahood. I relate it to wanting to run a marathon and sitting on your sofa reading Born to Run — you won’t get very far unless you put on your running shoes (or even barefoot like Abebe Bikila) and take your stride outside. I started my interest in the Buddha nature through literature, but I realized by practicing meditation was when I began to understand. The words of HH Chatral Rinpoche teach me that what is required is to begin and then to practice meditation with authenticity of intention and with compassion for all. Some people say compassion for all, to reach awareness towards an infinite number of beings, seems vague and abstract — understandable. Consider cultivating focused attention in a benevolent manner towards any beings that come into your field of awareness. Aren’t you just bragging about all the hardships and deprivation? Whichever method is best suited to your own capacity. This is true victory for the real warrior who carries no weapons. see the world spinning round. Katherine Meadowcroft is a dedicated and passionate advocate for the visual and literary arts; and also for environmental sustainability, supporting the efforts to eliminate plastic pollution. She has run competitively and cycled for thirty years, has hiked many trails for more than thirty years and began summiting mountaintops four years ago. Katherine began practicing yoga eighteen years ago, and began her meditation practice nine months ago. She received her Bachelor of Science in Kinesiology from University of Washington and her Master of Arts in English and American Literature from Mills College and is a regular contributor to the Huffington Post. As a young artist, I am constantly trying to create structure and stability for myself within the hectic world of working freelance. I find guidance in podcasts, blogs, and twitter feeds written by professional artists and entrepreneurs who are happy to share their behavioral patterns and “life hacks” with people like me, hungry for any tips that might just be the key to success. After mining the internet for such information, the most frequently cited practice is some form of daily meditation. Up until a month ago, meditation was something I only did in yoga class. As many of you know, the ambiance at Five Pillars feels much like a high end spa — the warm lights, the sweet smell of essential oils, and the nurturing voice of my teacher allow me to escape into the present moment, and experience a sense of restorative peace that feels a lot like the moments during and after a great massage. Meditation is easy there — it feels effortless. This was not my experience when I first tried meditating at home. I quickly realized the thing I missed most was a soothing voice guiding me through the meditation. My mind was quick to wander in the silence, and I didn’t quite know what I should be thinking about … or not thinking about. A friend recommended I download a guided meditation app like Headspace or Calm to make this new practice a bit easier. At first, I scoffed – of course there are apps to help you “unplug” and free the mind. But after doing a bit of research, I realized apps like Headspace have over 4,000,000 meditating users from over 150 countries around the world. I had to try it out. The app is pristine. The design is simple and playful, which makes the experience of working through it accessible and fun. Find a place you will be undisturbed for 10 minutes – ideally with some peace and quiet. Try to practice at the same time every day – it’s easier to create a new habit this way. Meditating first thing in the morning is a great way to start the day. Don’t worry! On some days it will be hard and others easy, gently stay with it. Sit comfortably on the floor or in a chair. Either works fine. You then begin the 10 minute session with Andy as your guide, a British man with an uplifting voice. Not only does he help you focus on your calming breath, but he offers new ways to interact with passing thoughts. The first few days were glorious. Perhaps it was just my excitement about finally being a “person who meditated every day,” but within the first three days of my practice I felt more clear headed, grounded, and relaxed. The intense feelings of change seemed to level out as I continued my journey, and now that I’m deeper into the practice the effects are more subtle. However, I know what I am doing is good for my mental health. Overall, I feel less anxious and stressed, and in moments when those feelings arise, I have a few more tools at my disposal to handle them. Through this journey, I have realized that “bad”/negative thoughts are inevitable, but it’s how I relate to them that counts. There have been countless studies that show the positive, long term effects of consistent meditation. Not to mention the positive effects of the focused breathing that come with meditation. But most surprising to me has been how easy it is to actually do it every day. It is a quick 10 minutes that I dedicate right when I wake up. And on those days when I oversleep and am rushing out of the house, I use the subway ride to work to get in my 10 minutes. This small effort allows me the same sense of rejuvenation that an hour long yoga class usually provides, and on days when I can’t get to the studio, I cherish that 10 minute gift. In yoga, we call the layers of our beings koshas. During our practice on and off the mat, we can begin to sense that we have several aspects of our beings. And, when we begin to cultivate nonjudgmental self awareness and observe the layers of our being with non attachment, our hearts open… and deeper healing occurs. Go deeper with this article by Yoga Journal: You Are Here. And check out this article by Kripalu: Healing Anxiety and Depression: An Ayurvedic Perspective. Our first Summer Wellness Retreat began with Olga leading a dynamic and balanced morning practice on the flagstone patio outside of George and Joan Hornig’s storied barn in Watermill. Oversized outdoor umbrellas with gorgeous, rustic tree-stump bases (designed by Joan) cast shade over the mats as Olga stretched out our spines and hips, fired up our core strength and let us through a creative standing vinyasa series. Afterwards, Karen served refreshing green smoothies of pineapple, kale and cucumber, and we sat for a morning discussion on Right Movement. It was a lovely morning and it set the mood. The entire two days would be intimate, informative and inspiring… relaxing and reinvigorating… and chock full of culinary delights! The menus, created by Karen and long-time collaborator Jamie Sydney, featured sesame asparagus, cod with orange miso sauce, farm fresh tomatoes with fresh pesto, green quinoa with zucchini and almond sweet potatoes. The intention was to not only discuss Right Nutrition, but also experience it as we savored Every. Delicious. Bite. We’ll be sharing the recipes and nutritional information in the weeks to come, so if you missed the retreat you don’t have to miss out on the healthy indulgences. Between a walking meditation led by Jeff Brown, massages offered by Regine Rousseau, and an aromatherapy experience led yours truly, there wasn’t one person who escaped a mini-nap during our afternoon Yoga Therapeutics practice on the grass under the swaying maple trees. It was a net-relaxing day to say the least. Meg Walsh-Sinkel opened the second day with an Ashtanga-led series — novel to most, and transcendent to all. She guided with precision and heart, helping us deeply connect to body and Right Breathing. We were so in the flow, our discussion that morning quickly evolved into demos, hands-on assists and individual movement labs that went right up until lunch! Perhaps the juiciest discussion of the event was “Aging Gracefully” that second afternoon. We combined Western and Eastern science for a holistic approach to maintaining vim, vigor and visage! We’ll be sharing the information and referrals for various anti-aging doctors, facialists and products that have been tried and tested. Plus, of course, Ayurvedic and Yogic methods for sustaining youthful energy — all designed to allow our inner light to shine bright, and, yes, keep us looking and feeling our best. A slow and succulent two-hour restorative yoga class and guided meditation, courtesy of Jeff Brown, closed the retreat, ensuring that nobody left with even a drop of stress in their systems. It is an understatement to say that we are awash in gratitude. It simply wouldn’t have been possible without the participation of our registrants, our gifted teachers who gave so much of themselves, our studio manager Brad and coordinator Lauren, and of course our generous hosts George and Joan Hornig. We thank you. It is because of each and every one of you that we are able to contribute all proceeds, plus a little extra 😉 to The Retreat in East Hampton to support the invaluable work that they do. It was Five Pillars’ first retreat, and it reinforced just how much fun it is to #GoDeep into the practice, movement, food, intention and fun of yoga! We’ve shared this little recap so that you know what to look forward to the next time. We’ll hope to see you on the mat, by the pool, under the maples, or gathered around the table, each of us the teacher, each of us the student. Namaste and see you in the Fall! At the beginning of yoga class, our teachers might invite you to set an intention, which you can carry through your practice and then off the mat into the rest of your day. If you’re new to this idea, it can seem weird and/or forced. Plus, it’s sometimes hard to think of an intention on the spot! Besides all that, you might wonder, what’s the point? Setting an intention is not required at all to have a lovely and beneficial yoga experience. Stick with the body, stick with the breath and you’re already winning. If you want to go a little deeper, setting an intention is something that can help invite a different focus into your practice. And as you get more familiar with setting an intention, it can become a special way you think of someone you love, send energy to someone in need, or simply honor your own efforts to build strength, develop compassion, take time for yourself and so-on. So why do we do this? The reason might be different for everyone, but a bottom line is: Our thoughts are powerful. We are creating energy on the mat, why not channel that energy into creating a reality that is meaningful for us? If you set an intention, try to check in with it from time to time during the practice. Sometimes I imagine my intention as a little balloon or a fire that is getting bigger and bigger with each pose or each breath I take. My movements are feeding energy into the intention, giving it strength. Right Relaxation… probably tougher for New Yorkers than most people. Sure the city is fast paced, sure work can be anxiety producing, sure we might not be getting enough sleep… but that’s the case for everyone so what’s the big deal? Well, the big deal is, that by living in a state of almost constant stress — even just a very low base line of stress — we keep our systems flooded with the stress hormone cortisol. Cortisol contributes to a plethora of chronic illnesses like diabetes, high blood pressure and cardiovascular diseases, weight gain, and all sorts of auto-immune disorders including arthritis and chronic pain. You can read more about how cortisol works and its effects here. The good news is more and more research is coming out showing the direct impact relaxation and meditation have on overall stress levels, and how these practices reduce cortisol levels. Here’s a great article from UC Davis about their research project, and another from Psychology Today that talks about the effects of simple meditation on our overall health and wellbeing. It might feel weird at first, taking time out of your busy day to just sit still and listen when you could be doing laundry/paying bills/running errands/working… the list goes on and on, I know! But, bottom line is, the impacts on health and wellbeing are vast, which has implications for all areas of our lives. Give it a try… Even five minutes a day counts.